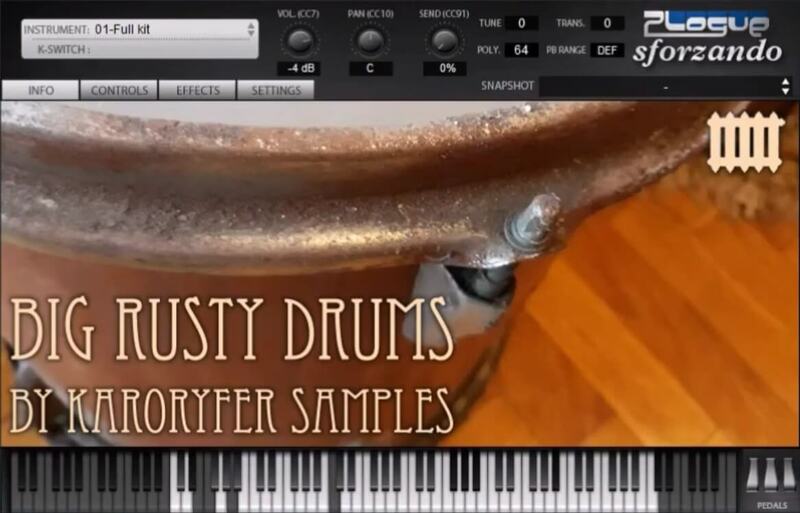 Karoryfer Samples has a new virtual drum kit for the free Plogue Sforzando sampler called Big Rusty Drums, featuring the sounds of a drum kit that was built by Zygmunt Szpaderski in a one-man workshop in Poland. The collection also includes sounds from a large floor tom made from an Estonian-made RMIF kick drum, and some nice modern cymbals. While we paid the equivalent of $111.68 for the Szpaderski kit with hardware, stands and cymbals, the Sabian ride cost more than four times as much, and we don’t care – they are a good match sonically. We also don’t care that it’s ridiculous to spend almost 100 hours recording and editing samples of drums this cheap, when we could just as easily have avoided spending any money at all and borrowed a much more expensive kit from a drummer friend. This way was a lot more interesting. It all adds up to a kit that can do a lot of things from indie pop to lo-fi hip-hop and all-out weirdness. Samples with sticks, brushes and mallets, snare also recorded with a tambourine on top of it and a small tom on top of it, rim clicks and shell clicks, stirs on both the snare and floor tom, a stack of cheap cymbals, mechanical noises… this kit has a lot of features, many of which you can’t get elsewhere. Over 4400 samples adding up to 2.3 GB. Where else are you gonna get samples of overgrown Soviet Bloc drums with this kind of detail? Large kick, deep snare, and four extremely large toms ranging from 14×14 to 22×16. Hi-hat with six degrees of openness, shank and tip hits, foot pedal chiks, foot splashes, and return noises. Crash, ride, China crash, sizzle ride, sizzle crash cymbals plus a cymbal stack. Samples with sticks, brushes and mallets. Time-adjustable stir and flutter techniques for the snare and floor tom. Samples of rim clicks, shell clicks, and pedal mechanism noises. Controls for adding transposed copies of mics and shortening the sound. 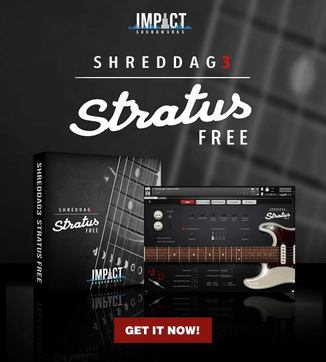 The sample library costs $39 USD. You can grab it for the intro price of just $9 USD until February 28th.